So many people asked me why i don't have much desserts on the site and i always replied them you will get them, and today i decided to share with you the recipe that almost all the middle east, most of Africa, Turkey and Greece claiming to be theirs, so i decided to cook it and see if i can get taste of any of these nations. 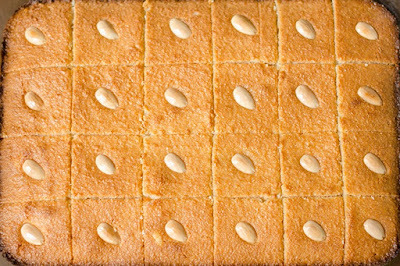 When we tasted it in my house, we were so surprised from the taste of Basbousa cake, it does have powerful taste which reminds you the power of Greece back in the times of Alexandra the great, it also gives the sweetness of Egyptian love, the warmness of Sahara desert can also be felt, it does have Arabic influenced flavors with Turkish beauty to the taste as well, so it is hard to say who invented it. 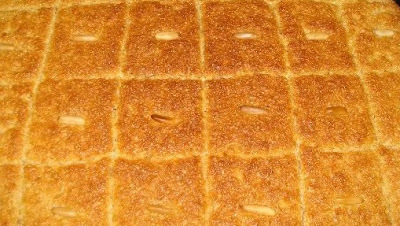 This soaked in syrup semolina is very simple to make and the only difference between Indian / Pakistani Suji ka Halva is that Basbousa is baked and suji ka halva is cooked in a pan. If you like it please do use comment box below and do not forget to subscribe our site to get new recipes everyday, we don't just share the recipes from around the world, we dig the history for you to bring some of the best recipes for you and we bring the memories of ancient life into your kitchen. In a bowl add semolina, baking powder, sugar, melted margarine and soy milk and mix well, add eggs one by one, add vanilla essence, yogurt and baking soda and mix well. Grease baking tray with oil and add the mixture in the backing tray, sprinkle the chopped almonds on top. preheat oven at 190 degrees. bake for 30 minutes till cake is golden. While cake is baking you will need to make the syrup. Heat the water and sugar for the syrup and bring to the boil, add the lemon juice, cook for around 5 minutes or till it becomes thick, let the syrup cool down. Take the cake out of oven and pour syrup on top.